is what 32 looks like. 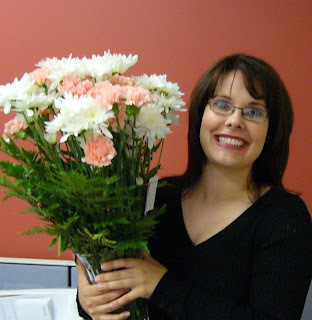 Yup, that would be me holding my beautiful flowers that my aunt surprised me with at lunch time. Or what should have been lunch time. So how did I spend my birthday? Well I started work at 7 a.m. and rushed out to the doctor at 5 p.m. minus a proper lunch break (lunch was a couple pieces of pizza eaten in ten minutes in the boardroom with my boss). We were go go go all day today. But it was still nice, see the flowers from my aunt. My sister sent me a text message at 1 to wish me a happy birthday so I called her and received wonderful well wishes from my nieces. I came home to a birthday email from my brother and a pile of wall postings on Facebook. I definitely feel loved! All in all a good day.